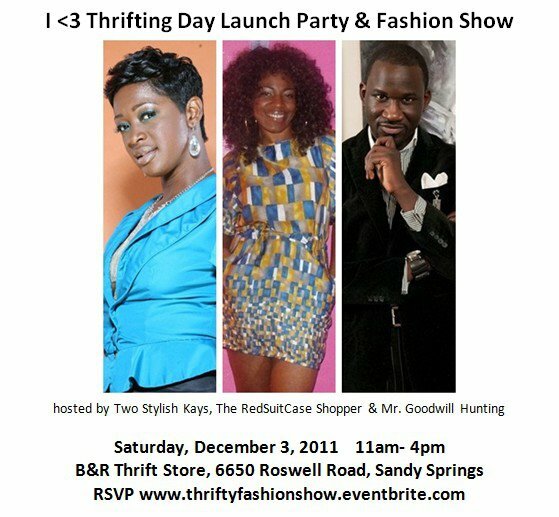 i will be giving away a few NEW "i <3 thrifting" t-shirts during the i love thrifting day ANNOUNCE PARTY 2012 in atlanta ga.
the announcement party is to announce the date for the 2012 "i <3 thrifting" day event. i will also be doing a meet-and-greet and on friday december 2nd at 6:30pm. i will be canvassing the store to pick on the best items so that you may shop with me that evening. this event is by RSVP ONLY! RSVP to rashon@rashoncarraway.com. in the subject line type Meet & Greet. in the body include your name and the name of your guests. so who is meeting me in atlanta?